B & B @ Cwmllechwedd Fawr Holidays01597 840741work Guest AccommodationCwmllechwedd Fawr stands on an old drover’s route a mile and a half from the Glyndwr's Way National Trail and with the nearest neighbours nearly a mile away, expect peace and tranquility in abundance. 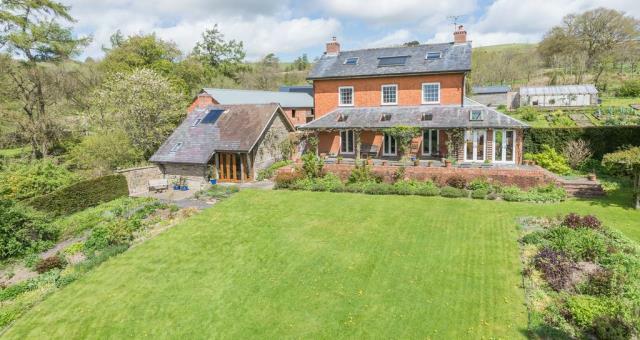 Cwnllechwedd Fawr has three beautiful and contemporary rooms, each with en suite bathrooms and also a holiday cottage on the farm is available to let. All the rooms are spacious and have their own distinct character with views of the gardens and surrounding countryside. Each room is luxuriously furnished, with a comfortable super-king or king-sized bed (super-king can be twin on request) and a sofa or comfy chairs. Breakfast is prepared fresh in the large farmhouse kitchen and served in the main hall, where guests can dine around the large farmhouse table and make plans for the day ahead. Nearby you will find both walking and cycling trails and Cwmllechwedd have cycle washing facilities, repair kits and safe storage available for riders. 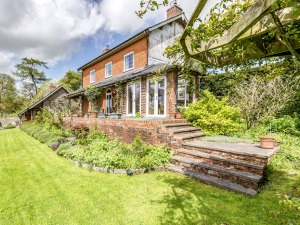 The farmhouse is pre-Victorian country farmhouse and originally built for Edward Meredith a tithe collector and landowner, with the bricks for the house being fired on site with clay from our appropriately named ‘brick field’. Today Cwmlechwedd is a sheep and beef rearing farm with a history that includes a blacksmith’s shop and early primitive Methodist meeting house, as well as colourful links to Welsh Nationalism. The grid shows the prices and daily availability from Mon 22 Apr 19 to Mon 29 Apr 19. It's easy to check availability for particular dates; just use the calendar to choose the check in date, select the number of nights and click the 'Search' button. Click the Book Now or Book Direct button to book the highlighted days. With Book Now the room booking will be confirmed immediately, with Book Direct the room reservation will be confirmed within 24 hours..
Cwmllechwedd Fawr stands on an old drover’s route a mile and a half from the Glyndwr's Way National Trail and with the nearest neighbours nearly a mile away, expect peace and tranquility in abundance. Please note that the neither the holiday cottage or the main house are able to cater for children under the age of 12. Please let the owner know if you have a small baby and they can make special arrangements. Children welcome from age 12.